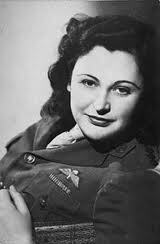 Nancy Wake "The White Mouse"
In nearly four decades in the media, Grubsheet has encountered hundreds of interview subjects yet few made such a lasting impression as Nancy Wake – the French Resistance heroine who has died in London at the age of 98. No superlative does justice to the unstoppable force of nature that was Nancy, even in her twilight years. To anyone who met her, she was quite simply unforgettable. The year was 1982 and Grubsheet was a Sydney television journalist tasked with covering both the news and contributing to a daily magazine program. The “peg” or reason for the interview with the woman the Nazis called “The White Mouse” is lost to memory but perhaps there wasn’t one. The fact that Australia’s bravest war hero was living quietly in a modest unit in the suburb of Lane Cove was probably enough. We knew her story yet nothing could have prepared us for the woman herself. Nancy wasn’t especially tall but the word imposing also doesn’t do her justice. She quite literally swamped whatever space she occupied through sheer force of personality. The initial image of her – round faced, keen eyed, a mane of white hair pulled back in a bun and a cheery “come in and make yourself comfortable” – is seared in our mind’s eye forever. So is the next comment. “Good, it’s eleven o’clock, let’s have a gin and tonic”. Many hectares of newsprint will be consumed telling the incredible story of Nancy’s life. Yet it’s safe to say that few journalists will have sat, as we did, amid the chintz of a suburban lounge room being told by a woman how she once killed a man with her bare hands. When Nancy Wake talked about the Gestapo, her eyes narrowed, her face darkened and her voice lowered into a tone of sheer hatred. They tortured and killed her first husband, Henri Fiocca, because he refused to disclose her whereabouts. Nancy didn’t discover his fate for another two years, until after the war had ended. As she told the story nearly 40 years on, jagged pain cut through the hatred. But only momentarily, as she held up her hands to demonstrate how she’d drawn the life out of a hapless Nazi sentry. Through the interview and its lengthy denouement, Nancy had her glass constantly refilled by the man she eventually found happiness with again, in 1957 – John Forward, her second husband. John was the epitome of the World War Two fighter pilot he’d been, almost to the point of parody. Tall, quietly spoken and 1940s handsome, with a bristling mustache to complete another unforgettable memory for Grubsheet of having shaken hands with one of “The Few”. At the time, Nancy was scathing about how she’d received France’s top honours – the Legion D’Honneur and Croix De Guerre – Britain’s George Medal and the American Medal of Freedom yet had never been recognised for her bravery with an Australian award. It turns out to have been because she was actually born in New Zealand and came to Australia when she was two years old. 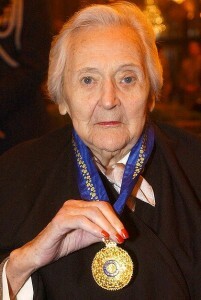 The oversight was eventually rectified in 2004, when she was made a Companion of the Order of Australia, the country’s highest honour. Doubtless the authorities were stung by Nancy’s withering comment of several years before: “They can stick their medals where the monkey sticks his nuts”. 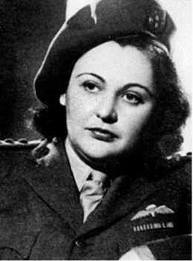 Nancy Wake. Forthright and brave to the end. We will never see her like again. 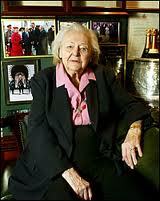 For more details of Nancy’s extraordinary exploits, here’s a link to the London Daily Telegraph’s obituary.